This article is about the electrical component. For other uses, see Relay (disambiguation). A type of relay that can handle the high power required to directly control an electric motor or other loads is called a contactor. Solid-state relays control power circuits with no moving parts, instead using a semiconductor device to perform switching. Relays with calibrated operating characteristics and sometimes multiple operating coils are used to protect electrical circuits from overload or faults; in modern electric power systems these functions are performed by digital instruments still called "protective relays". 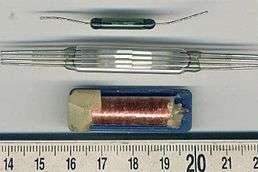 Magnetic latching relays require one pulse of coil power to move their contacts in one direction, and another, redirected pulse to move them back. Repeated pulses from the same input have no effect. Magnetic latching relays are useful in applications where interrupted power should not be able to transition the contacts. Magnetic latching relays can have either single or dual coils. On a single coil device, the relay will operate in one direction when power is applied with one polarity, and will reset when the polarity is reversed. On a dual coil device, when polarized voltage is applied to the reset coil the contacts will transition. AC controlled magnetic latch relays have single coils that employ steering diodes to differentiate between operate and reset commands. American scientist Joseph Henry is often claimed to have invented a relay in 1835 in order to improve his version of the electrical telegraph, developed earlier in 1831. However, there is little in the way of official documentation to suggest he had made the discovery prior to 1837. A simple device, which is now called a relay, was included in the original 1840 telegraph patent of Samuel Morse. The mechanism described acted as a digital amplifier, repeating the telegraph signal, and thus allowing signals to be propagated as far as desired. This overcame the problem of limited range of earlier telegraphy schemes. 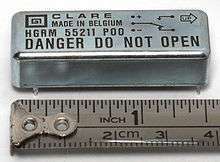 Small "cradle" relay often used in electronics. The "cradle" term refers to the shape of the relay's armature. Contactors can be noisy when they operate (switch on or off), so they may be unfit for use where noise is a chief concern. In such cases solid-state relays are preferred. As every solid-state device has a small voltage drop across it, this voltage drop limits the amount of current a given SSR can handle. The minimum voltage drop for such a relay is a function of the material used to make the device. 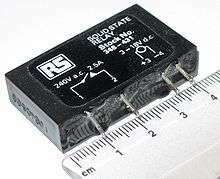 Solid-state relays rated to handle as much as 1,200 amperes have become commercially available. Compared to electromagnetic relays, they may be falsely triggered by transients and in general may be susceptible to damage by extreme cosmic ray and EMP episodes. Since relays are switches, the terminology applied to switches is also applied to relays; a relay switches one or more poles, each of whose contacts can be thrown by energizing the coil. Normally open (NO) contacts connect the circuit when the relay is activated; the circuit is disconnected when the relay is inactive. It is also called a "Form A" contact or "make" contact. NO contacts may also be distinguished as "early-make" or "NOEM", which means that the contacts close before the button or switch is fully engaged. Normally closed (NC) contacts disconnect the circuit when the relay is activated; the circuit is connected when the relay is inactive. It is also called a "Form B" contact or "break" contact. NC contacts may also be distinguished as "late-break" or "NCLB", which means that the contacts stay closed until the button or switch is fully disengaged. Change-over (CO), or double-throw (DT), contacts control two circuits: one normally open contact and one normally closed contact with a common terminal. It is also called a "Form C" contact or "transfer" contact ("break before make"). If this type of contact has a "make before break" action, then it is called a "Form D" contact. SPST – Single Pole Single Throw. These have two terminals which can be connected or disconnected. Including two for the coil, such a relay has four terminals in total. It is ambiguous whether the pole is normally open or normally closed. The terminology "SPNO" and "SPNC" is sometimes used to resolve the ambiguity. SPDT – Single Pole Double Throw. A common terminal connects to either of two others. Including two for the coil, such a relay has five terminals in total. DPST – Double Pole Single Throw. These have two pairs of terminals. Equivalent to two SPST switches or relays actuated by a single coil. Including two for the coil, such a relay has six terminals in total. The poles may be Form A or Form B (or one of each). DPDT – Double Pole Double Throw. These have two rows of change-over terminals. Equivalent to two SPDT switches or relays actuated by a single coil. Such a relay has eight terminals, including the coil. The "S" or "D" may be replaced with a number, indicating multiple switches connected to a single actuator. For example, 4PDT indicates a four pole double throw relay that has 12 switch terminals. There are many considerations involved in the correct selection of a control relay for a particular application. These considerations include factors such as speed of operation, sensitivity, and hysteresis. Although typical control relays operate in the 5 ms to 20 ms range, relays with switching speeds as fast as 100 us are available. Reed relays which are actuated by low currents and switch fast are suitable for controlling small currents. For protection of electrical apparatus and transmission lines, electromechanical relays with accurate operating characteristics were used to detect overload, short-circuits, and other faults. While many such relays remain in use, digital devices now provide equivalent protective functions. Part of a relay interlocking using UK Q-style miniature plug-in relays. UK Q-style signalling relay and base. Railway signalling relays are large considering the mostly small voltages (less than 120 V) and currents (perhaps 100 mA) that they switch. Contacts are widely spaced to prevent flashovers and short circuits over a lifetime that may exceed fifty years. BR930 series plug-in relays are widely used on railways following British practice. These are 120 mm high, 180 mm deep and 56 mm wide and weigh about 1400 g, and can have up to 16 separate contacts, for example, 12 make and 4 break contacts. Many of these relays come in 12V, 24V and 50V versions. QBCA1 Contactor for high current applications such as point motors. Also DC biased and AC immune. Signalling relays, typical circuits, drawing symbols, abbreviations & nomenclature, etc. come in a number of schools, including the United States, France, Germany, and the United Kingdom. ↑ Gibberd, William (1966). "Edward Davy". Australian Dictionary of Biography. Canberra: Australian National University. Retrieved 7 June 2012. ↑ Mason, C. R. "Art & Science of Protective Relaying, Chapter 2, GE Consumer & Electrical". Retrieved October 9, 2011. 1 2 A. C. Keller. "Recent Developments in Bell System Relays -- Particularly Sealed Contact and Miniature Relays". The Bell System Technical Journal. 1964. ↑ Croft, Terrell; Summers, Wilford, eds. (1987). American Electricians' Handbook (Eleventh ed.). New York: McGraw Hill. p. 7-124. ISBN 0-07-013932-6. ↑ Kenneth B. Rexford and Peter R. Giuliani (2002). Electrical control for machines (6th ed.). Cengage Learning. p. 58. ISBN 978-0-7668-6198-5. ↑ Zocholl, Stan (2003). AC Motor Protection. Schweitzer Engineering Laboratories, Inc. ISBN 978-0972502610. ↑ EN 50005:1976 "Specification for low voltage switchgear and controlgear for industrial use. Terminal marking and distinctive number. General rules." (1976). In the UK published by BSI as BS 5472:1977. ↑ "Relay Automatic Telephone Company". Retrieved October 6, 2014. ↑ "British Telecom History 1912-1968". Retrieved October 8, 2014. 1 2 "Arc Suppression to Protect Relays From Destructive Arc Energy". Retrieved December 6, 2013. ↑ Al L Varney. "Questions About The No. 1 ESS Switch". 1991. ↑ "Lab Note #105 Contact Life - Unsuppressed vs. Suppressed Arcing". Arc Suppression Technologies. April 2011. Retrieved October 9, 2011. Wikimedia Commons has media related to Relay. "Harry Porter's Relay Computer", a computer made out of relays. "Relay Computer Two", by Jon Stanley.